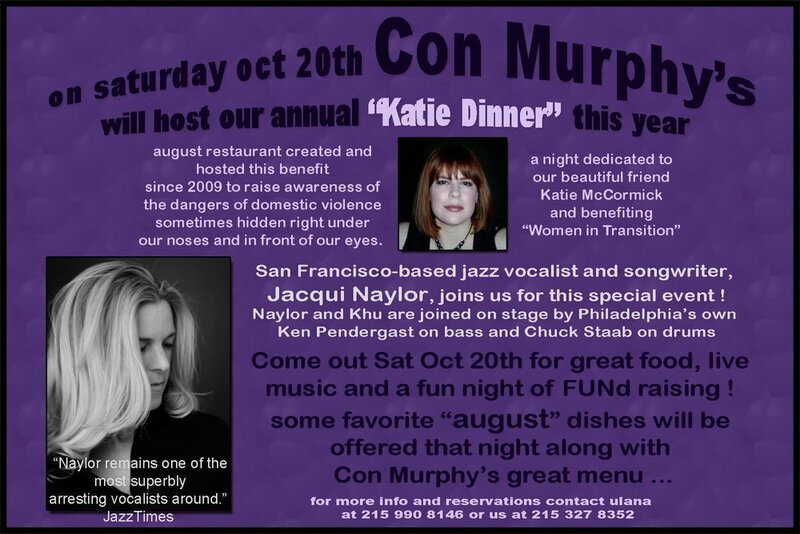 The Katie Dinner will feature a live performance by renowned jazz vocalist Jacqui Naylor and pianist/guitarist Art Khu, a raffle, and "August Restaurant" dishes on Con Murphy's menu! We thank Maryann Brancaccio and Maria Vanni of August Restaurant, the August Restaurant community, musicians Jacqui Naylor and Art Khu, and Ulenna and Con Murphy's for their generosity in organizing and hosting this fundraiser for WIT. For more info or to RSVP, contact 215.990.8146 or 215.327.8352! Older PostCome to our Happy Hour Fundraiser!